Here, we have a great battle between two excellent products! 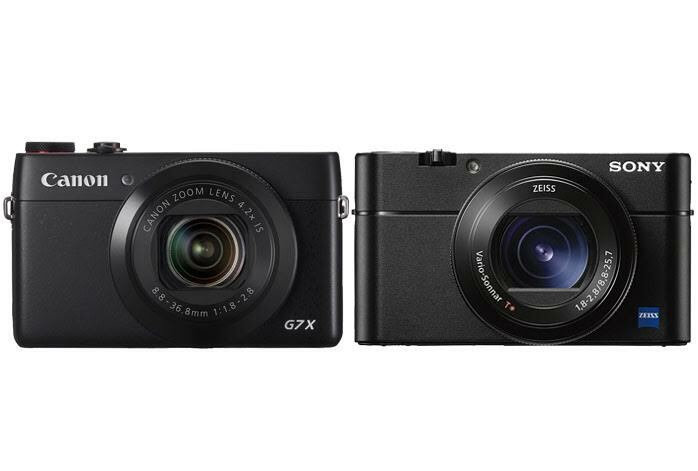 Both Canon G7X and Sony RX100 has been loved very much by many photographers because of their exceptional performance. Canon G7X is rather old but still gold. The camera is quite flexible and versatile to adapt to any condition. On the other hand, Sony RX100 is relatively a newcomer, yet the model has quickly gained lots of attention to the point that it has become the number one new release. So, how do they compare against each other? Continue reading below for the answer! Even though Sony RX100 is without a touchscreen, you may not really mind about that because the camera has been armed with the world’s fastest hybrid AF system. Boasting a total of 315 phase-detection points that nearly cover the entire sensor area, Sony RX100 can quickly and accurately track moving objects in your field of view. Canon G7X’s AF system, which is actually a decent one, only has 31 focus points. The difference is real. In addition, the 20 MP 1” Exmor RS stacked back-illuminated CMOS sensor of Sony RX100 is truly powerful. It can easily capture large-sized images with the most accurate and precise colors. The colors are full and solid, with great depth and dynamic range. Sony RX100 can already record 4K Ultra HD videos with direct pixel readout and no pixel binning. Canon G7X, on the other hand, is armed with a 20 MP 1” BSI CMOS sensor, too, but the maximum video quality is only 1080p Full HD. Both Canon G7X and Sony RX100 have the maximum shutter speed of 1/2000s. However, while Canon G7X tops its ISO at 12800, Sony RX100 offers up to 25600 extended ISO using the Multi Frame NR feature. Neither lens is exactly powerful for long-range shooting. Canon G7X comes with a 24-100mm lens with 4.20X maximum optical zoom, whereas Sony RX100 comes with a 24-70mm lens with 2.92X maximum optical zoom. Eventually, to conclude our comparison, we present Sony RX100 as the winner! Although it misses the touchscreen, it comes with an extremely powerful AF system. It also has better image quality compared to Canon G7X.